1) UC Berkeley Chancellor Dirks to publicly renounce Janet Napolitano. 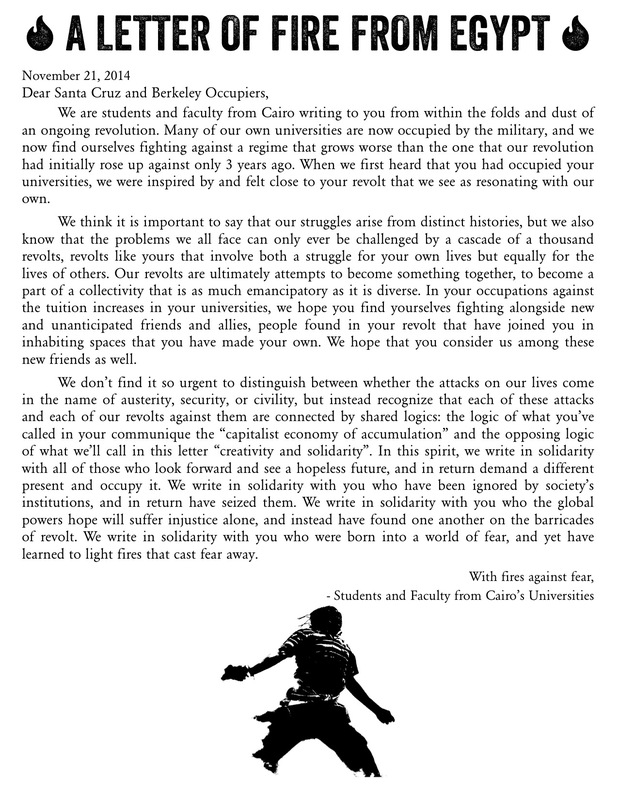 2) For all those in solidarity to cancel classes tomorrow (Friday, Feb 13), and for people to build a strike in support of Napolitano’s resignation and for the democratization of the University. 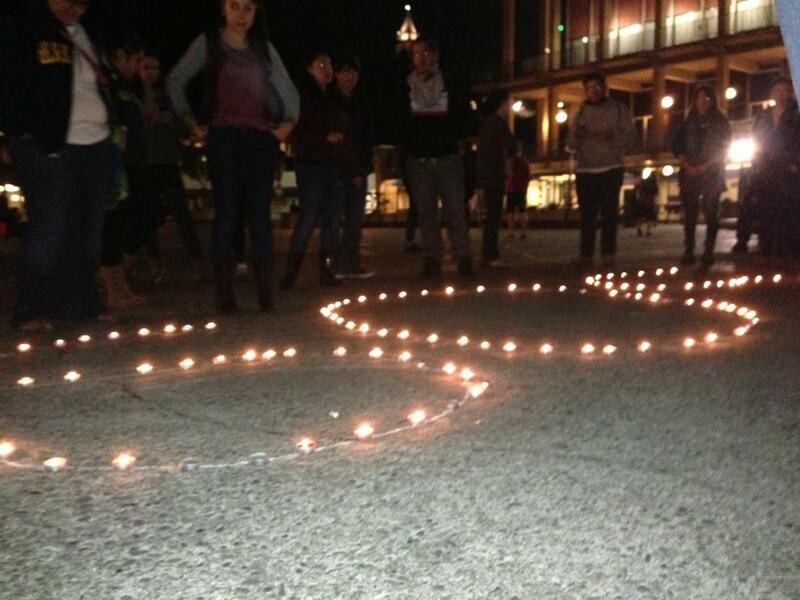 3) Full amnesty for all those reclaiming campus space, including those who have taken the Blum Center. Richard Blum, the primary funder and namesake of the Blum Center, represents and acts as a driving force of privatization and reorganization of the University of California system. As an investment banker, Blum profits from the fact that the UC is no longer funded primarily through the federal government. As a central figure in pushing away from federal subsidization of education, and therefore a completely affordable or free public education, Blum and other bankers and financiers on the board of regents–including Monica Lozano–have compelled the University to take out massive bonds from private banks to compensate for this lack of funding. Public funding is legally allowed to go to only educational resources bonds, and the tuition system that allow this process to happen can be used for whatever the regents want. In many cases, this money is tied to companies that these regents own. For example, Blum owns the equity management firm Blum Capital, which has massive investments in the companies that do all of the construction at the UC. To those who believe in a public and democratic education, this is seen as legalized fraud and corruption. UC regent Richard Blum was central in proposing Janet Napolitano. Richard Blum’s record includes firing Robert Dynes in 2007, leading the search for Mark Yudof, and encouraging Yudof’s resignation before overseeing the “search” for a new UC president. Although the Regents state that this was done through a headhunting agency, Blum was instrumental in making the final decision. We conclude that central decisions for filling the highest-ranking positions in the UC system continue to be made by those who stand to profit from privatization. Blum’s interest in keeping a business-as-usual that allows for massive profits for companies to which he has ties indicates Napolitano’s appointment as a means to continue this process of implementing policies of social control during her time in DHS. Blum’s 12 year term as a UC regent ended in January. His reappointment by Jerry Brown for a second 12 year term this past January shows that the regents, like him, will continue to retain power unless there is a social response to this injustice. 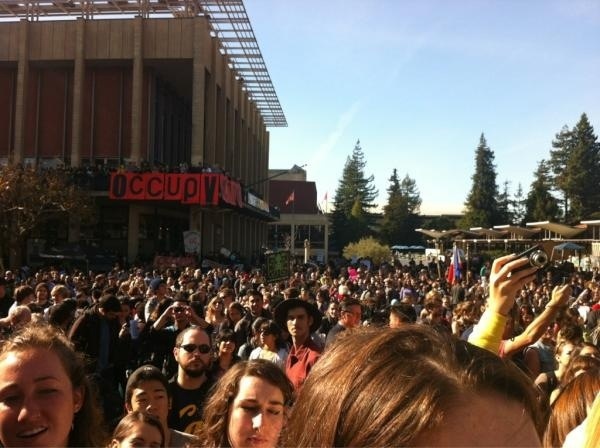 The appointment of Napolitano exposes the undemocratic process by which the UC system makes decisions. 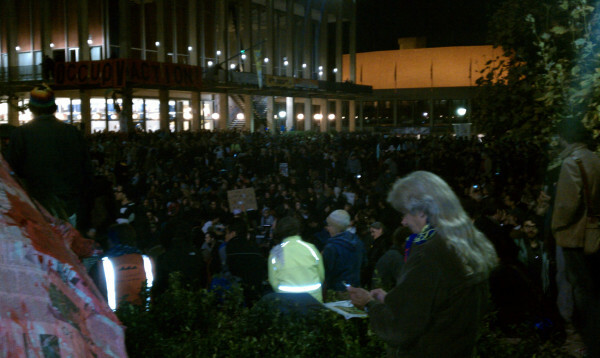 In order to address this structural problem, we demand a restructuring of this process which includes: a) a campuses-wide election for all future UC regents and presidents; this includes having the ability to nominate, endorse, and campaign for candidates b) the power to impeach both UC presidents and regents c) a general democratization of the regents to include actual participation of students, faculty, and UC workers in the central decision making processes of the University. We call on all students, faculty, and staff to join us, to take action in the coming days and weeks, and to demand the restructuring of the decision making process in our university system, so that we can make the promise of a public education a reality. 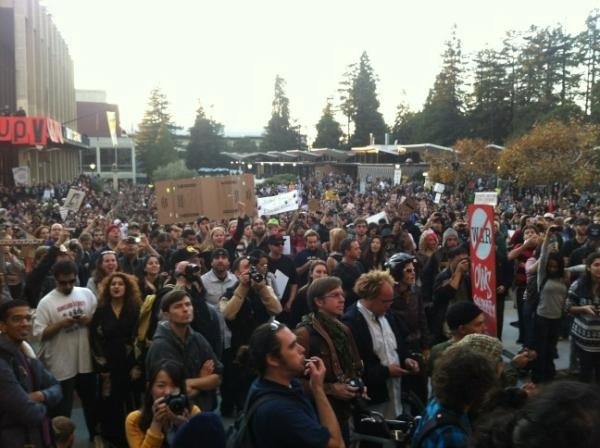 UC Berkeley Chancellor Birgeneau cancelled the order for the armored vehicle! ALBANY, California – Early Monday morning, around 80 Alameda County Sheriffs and UCPD raided the Gill Tract Farm and arrested demonstrators. The farm was established on April 22nd at a vacant lot owned by the University of California. Despite dialogue and signs of progress, the UC gradually began locking gates and blocking access to the urban farm last week. The UC expressed concerns over the periodical use of the land for research, to which occupiers and some UC researchers responded by agreeing to work together to find an amenable solution to allow coexistence. Around 7am, the police declared the area an unlawful assembly and summarily arrested those in the encampment. A re-convergence action has been organized for 5pm, Tuesday at the Albany Library, 1249 Marin Ave.
ALBANY, California – On April 22nd, a few hundred demonstrators broke ground at the Gill Tract empty lot on San Pablo and Marin and established a guerrilla garden. The land owned by the University of California, Berkeley, was periodically used for agricultural research, but was otherwise untouched. Community activists have spent a decade in dialogue with the university to open the land to the public. However, talk of selling the land to build a strip mall on this high grade agricultural soil launched demonstrators into action. On the 22nd, demonstrators tilled the land, transplanted seedlings, established chicken coops, set up tents, organized events and workshops, and inspired the community to flourish. 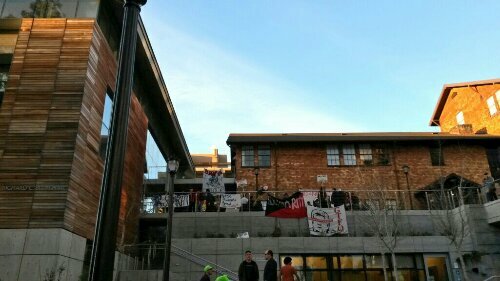 Although support for the new community farm flooded in from neighbors and members of the University of California, administrators at the UC threatened eviction multiple times through the course of the next two weeks, and then last week they finally gave demonstrators an ultimatum. Around 7am on May 9th, the UCPD [locked the west gates and placed concrete barricades to prevent vehicular traffic]. Around noon, UCPD closed the last remaining pedestrian gate. However no arrests have been made as of Thursday night. Read more. 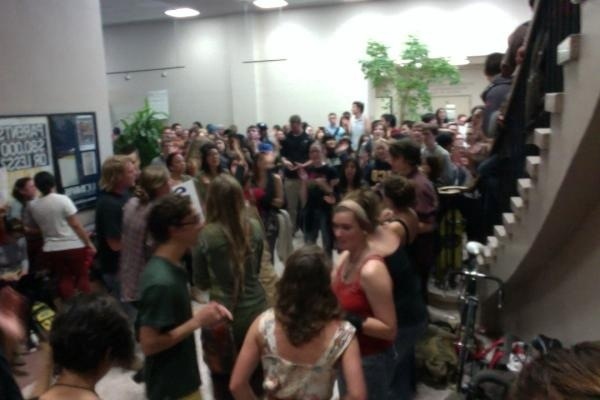 Last week, 12 students and professors were notified by the Yolo County District Attorney that they were being charged in relation to the blockade of an on-campus bank at UC Davis. Protesters had blockaded the branch of US Bank in opposition to its exploitation of students at Davis, and the banking industry’s profit-taking through increasing student debt and rising tuition in general. 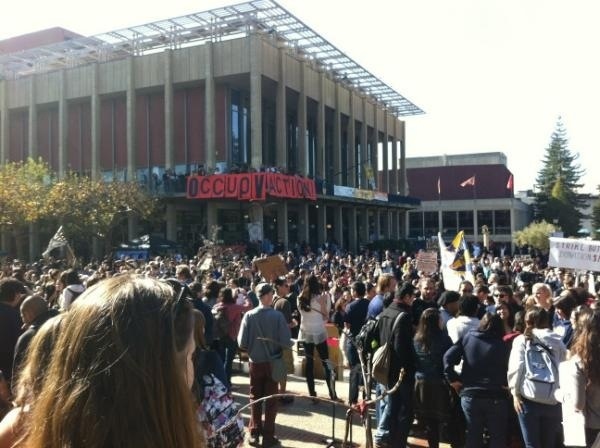 The protests were successful in getting the bank to close its doors and void its contract with UC Davis. Now, almost a month after the protests ended, these 12 are being charged with over 20 misdemeanor counts related to the blockades, and the Yolo County DA has indicated it might seek damages of up to $1 million dollars on behalf of the bank. As the recipients of a similar set of belated charges from the Alameda County DA, brought against us in relations to the events of November 9 at UC Berkeley, when students tried to set up a small “Occupy” encampment there and were viciously beaten by the police, we want to extend our solidarity to the 12 protesters charged. 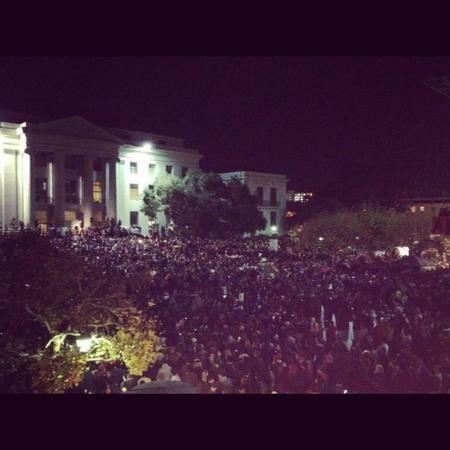 We condemn this opportunism on the behalf of UC Davis police and administration. They are clearly using the Yolo County DA to accomplish repression which they feel they are unable to undertake on their own, after the widespread public outrage at their behavior last fall, when sitting protesters were serially and vindictively pepper-sprayed. That incident, captured on video and viewed millions of times the world over, became an international symbol of the brutality of US police. In a talk given last year, UC Irvine Professor Rei Terada reflected on the fallout from the UC Berkeley and UC Davis incidents by predicting that, in the immediate future, campuses were not likely to resort to “the kind of violence you can photograph.” The developments at Davis and Berkeley have proven her remarks uncannily prescient. Afraid of public outrage and its endangerment of their jobs, UC administrators and police departments have farmed out the job of repressing students to local prosecutors. This allows the campus administrators to absolve themselves of any responsibility for the charges, claiming such matters entirely outside of their jurisdiction, even though in all of these cases charges could not have been brought without the active encouragement and collaboration of campus police. And so we see that, at Berkeley, Chancellor Birgeneau claims that he knew nothing about the charges filed against UC Berkeley protesters, even though his police department had forwarded to the DA specific recommendations to charge all 13 people. Either Birgeneau is not telling the truth or UC police acted, in this matter, without his oversight. Both are evidence of incompetence. At Davis, Chancellor Katehi, who nearly lost her job after the pepper-spray incident, instructed her police department to avoid confrontation and let protesters continuously blockade the US Bank branch for close to eight weeks, without ever arresting any of them. But, wanting to have it both ways, her police then forwarded the cases to the Yolo County DA. The last year has seen a remarkable flourishing of protest and resistance in this country. Hundreds of thousands of people have had the opportunity to experiment with new tactics and ideas. But this has also been a time of experiment and innovation for police forces and the courts, which have used the protests as a chance to deploy new weapons, and practice with new techniques of control and containment, as well as set new legal precedents which allow for greater repressive powers. This recent round of “jail-mail” might seem limited in scope but it sets the precedent for a future world where, based upon omnipresent surveillance, anybody who attends a protest might become the subject of a criminal complaint months or even years later. We understand this development not as the exception to the rule but rather the confirmation of a general trend toward the continuous expansion of the powers of the state, where civil disobedience-style tactics which, in other times and other jurisdictions, might be treated as mere infractions are met with the threat of jail-time and tens of thousands of dollars in fines. We hope that all sane people will stand with us in calling on the Yolo County DA to drop the charges. 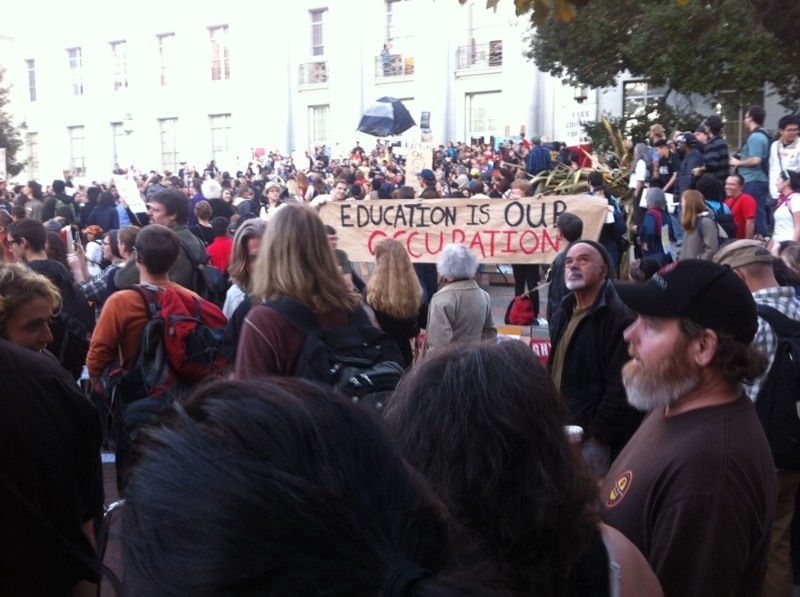 We are graduate students and teachers at UC Berkeley. 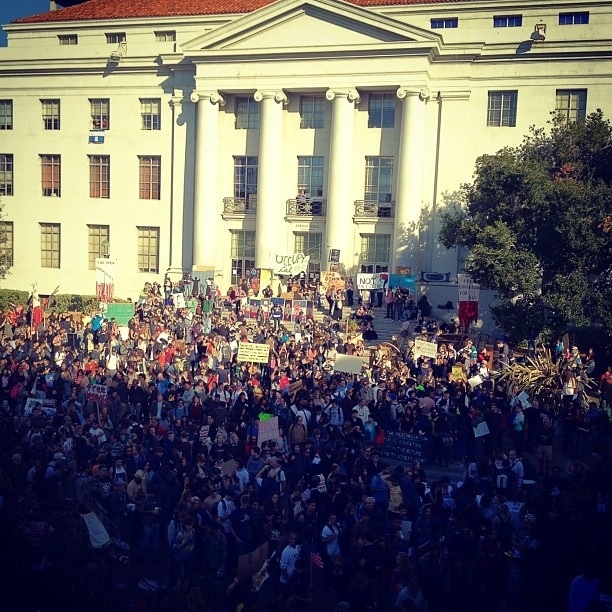 Like thousands of other members of people here at Berkeley, we have participated in rallies and demonstrations and marches against the privatization of the University of California. In early March of this year, however, we each received letters from the Alameda County District Attorney informing us that criminal complaints had been filed against us. No details of the complaints were listed, only the date we were to appear at Wiley Manuel Courthouse. That we were suddenly being charged for participating in the events of November 9 struck us as odd. Four months had passed. We had not been arrested on November 9, nor did we suspect that we were under investigation. The UC administration had even granted amnesty from student conduct charges for those who took part in the protest. We soon discovered that several friends (also students) were facing similar charges. Like us, most of them had also not been arrested that day. In total, 13 individuals have been charged, including a professor of English, who, when surrendering herself for arrest on November 9, was pulled to the ground by her hair by police. The various criminal complaints against us include resisting arrest, battery of an officer, obstructing a thoroughfare, and remaining at the scene of a riot. How the DA decided that we should face charges is not fully clear—although it is evident that they are bringing charges on the basis of recommendations received from UCPD, despite Chancellor Birgeneau’s protestations to the contrary. As UCPD spokesperson Lt. Tejada recently said, “We make our case, and the district attorney reviews the evidence, and if they feel they have enough evidence they will move forward.” Furthermore recent reports suggest that even campus health services had a hand in the selection and identification of protestors. 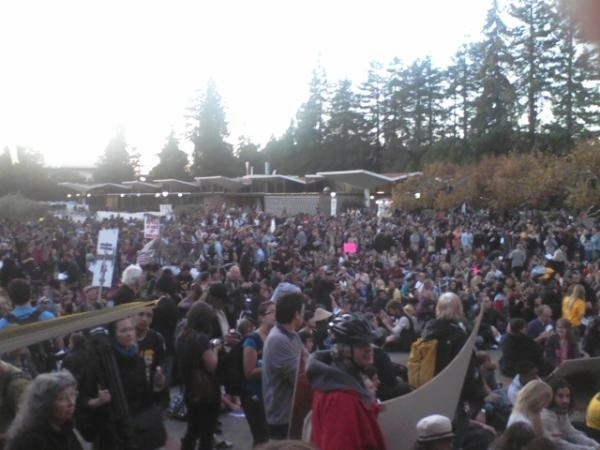 Hundreds of people were on hand the afternoon of November 9. 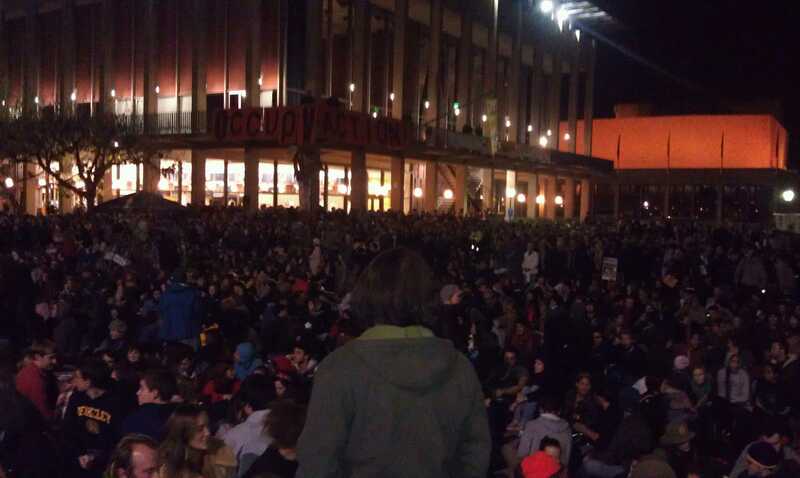 Even more were present on Sproul Plaza when police returned in the evening to again attack students and confiscate their tents, bringing out a crowd of at least 2000. 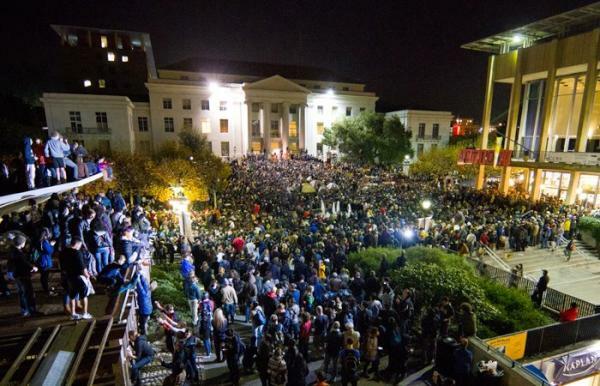 Nearly ten thousand supporters joined in a student strike at UC Berkeley a week later in response to the appalling actions of police. Why are only 13 out of these thousands being charged? Is it a coincidence that some of those targeted are highly visible organizers at UC Berkeley? Is the UC Berkeley administration outsourcing the criminalization of dissent to the Alameda County District Attorney, just as the UC Police Department outsourced the brutal repression of dissent on November 9 to the Alameda County Sheriff? Of course we are not taken aback by the situation in which we find ourselves. For months now, the Alameda County District Attorney’s office has been vindictively harassing anyone they suspect of taking part in the Occupy movement. Most recently the DA has started slapping stay-away orders on almost any activist brought before the court with ties to Occupy Oakland. This attempt to smother dissent through judicial means is simply a less spectacular (and far less bloody) approach than the hard-fisted tactics employed by their law enforcement brethren. Since we knew full well how the judicial system is being geared to criminalize and stifle dissent in Alameda County, we should not have been the least bit astonished when our judge—without the slightest hesitation—granted the DA’s request to issue us indefinite stay-away orders from the University of California. Nevertheless, the stay-away orders first issued on March 19 took us all by surprise. Had administrators of the University of California deemed us worthy of banishment from campus, they could have used their own established protocols and procedures to do so—something they have hardly been hesitant to use before. When asked why the stay away orders were to be applied not just to the UC Berkeley campus, but to all property owned by the University of California, the DA responded that we are known to travel to other campuses to protest meetings of the UC Board of Regents. The light this response sheds on the political motivation of the stay away orders should not be missed. We are now disallowed from stepping foot on any campus in the UC system for the simple reason that we might take part in political activity on UC property. The timing of these stay away orders, it should be noted, is extremely convenient for the UC administration: a major meeting of the UC Regents is scheduled at UC San Francisco next week. In issuing these stay away orders, the judge granted a narrow exception to all of us who are students, as well as a few other exceptions to particular individuals (i.e. for living in university housing, or for performing official union responsibilities). Those of us with classes and teaching duties (which includes 12 of the 13 being charged) are allowed to visit campus for “lawful business.” We can attend our courses and meet with our students as usual. While a reasonable exception to an unreasonable order, this further reveals how the stay-away orders have been constructed expressly to eliminate our political engagement on campus. The stay-away-order-plus-exception effectively distills our lives as students and workers from all other trivial or superficial aspects. We are reduced to mere academics, without political or social lives, whose sole purpose is to work and study and return home. We cannot attend a lecture on campus. Or meet with a friend for coffee. Or stop to talk with a former student. And we most certainly can’t attend any protest. The court is permitting us to contribute to business as usual at the university so long as we do not do anything outside of the strict delimitation of such business, as long we do not attempt to challenge it in any way. We are made into model students and workers, perfectly obedient, without the encumbrance of feelings and thoughts beyond our academic work on campus. Potentially complicating this analysis is the additional exception that one of us received for the performance of union responsibilities. 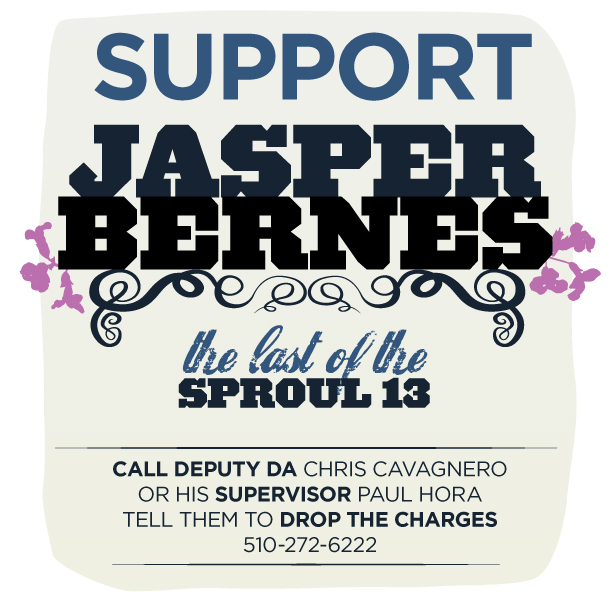 When this individual’s lawyer initially spoke with the District Attorney, letting the DA know that his client was an elected steward in the UC union of academic workers, the DA responded by asking: “Union work is totally unrelated to occupy protests, right?” If this question betrays a basic unfamiliarity with recent organizing on campus, it also reveals something about how union activity is generally understood at this historical moment. Union activity is imagined here as a form of labor, performed by elected bureaucrats, who are recognized by management as the legitimate representatives for, and regulators of, a particular workforce. Such work appears unrelated to, if not in fact antagonistic toward, the forms of non-hierarchical direct action practiced by the occupy movement. When partitioned in this way from protest, union activity can evidently appear as part of the lawful business of a student instructor, whose life is thus distilled into acts of labor, some instructional and others bureaucratic. BERKELEY, California – Over a hundred students took part in a study-in on Thursday at the Anthropology library at UC Berkeley in protest of more cuts to library hours. 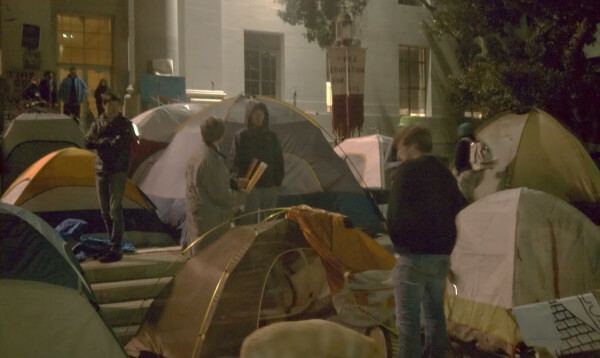 Protesters are keeping the library open past the 5pm closing time and have even erected a tent inside the library in the fashion of Occupy Wall Street. 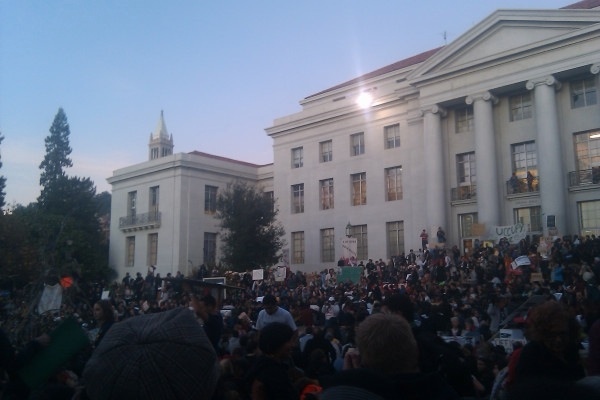 This same library was a catalyst in a series of occupations at UC Berkeley in the Fall of 2009. Watch live. We love our libraries and are here to protect them. Libraries are critically important for excellent education for all. 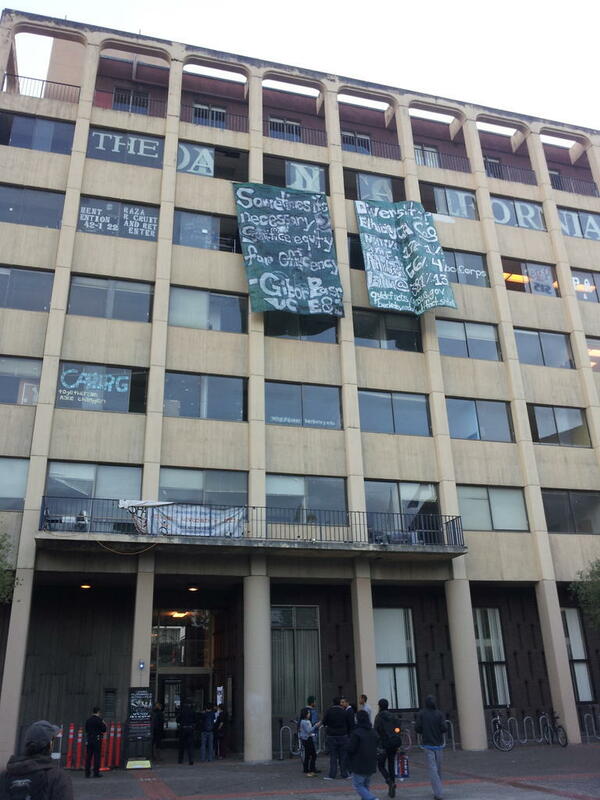 We students, faculty, and community members collectively have decided to occupy the Anthropology Library at UC Berkeley to protest the dismantling of the library system on campus and public education as a whole. We chose to occupy this space because the Anthropology library is a recent victim of extreme service cuts. The hours of operation are being cut from the previous, already slim, 9am-6pm to the current 12pm-5pm, because the university has not taken the necessary steps to sufficiently staff the library. The multiple attacks on campus libraries are a reflection of privatization and the devaluation of the public education system. We are here to reverse this process. We call on the administration to take immediate action to hire another full-time librarian to ensure full access to this valuable resource. The administration may claim that there are insufficient funds, but in reality these resources exist, but their allocation by UC administrators and the state does not adequately reflect the values of excellent public education. Why have the UC Regents continued to approve 21% increases in administration salaries, while students are being denied access to their libraries? Why are the taxes of the 1% so low while essential social services are being cut across the state and country? We stand in solidarity with the Occupy movement as a whole and the protestors at UC Riverside who were met with violence in their attempt to protest the austerity policies of the UC Regents, Sacramento, and Washington D.C.
Defend our libraries and schools. 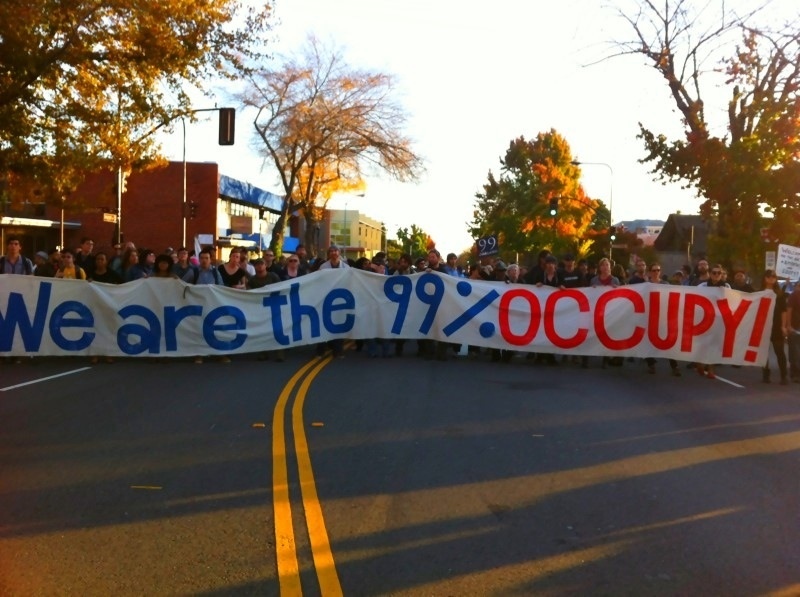 Occupy together. BERKELEY, California – The encampment that was established at UC Berkeley by 5-7000 people on Tuesday was raided early Thursday morning by police in riot gear. Police cleared Sproul Plaza, confiscating material and destroying tents using a backhoe. 2 were arrested. 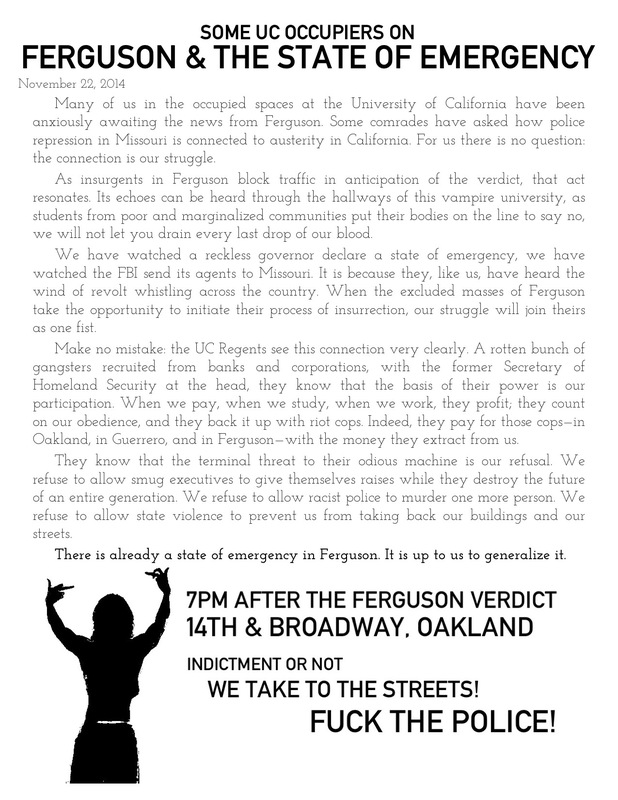 An emergency General Assembly this morning has called for a 5pm rally, and then a GA today in response.